The one question that hasn’t been answered is “what is the performance cost for installing mod_pagespeed”. 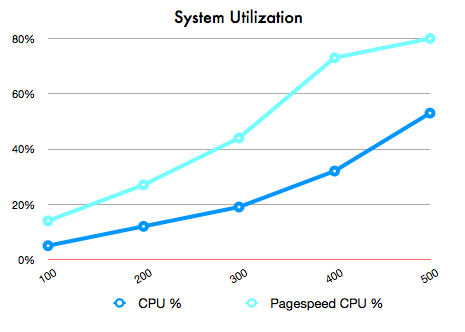 Pagespeed addresses only client-side performance, which is completely different from server scalability. 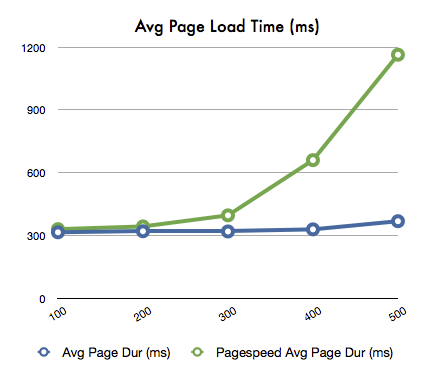 The actual page load times that customers see in practice is affected by both the page design and layout, and the actual speed of the server under load. This is a little project to take a look at what happens when a mod_pagespeed equipped Apache web server encounters load. To start off, let’s take a look at what mod_pagespeed did to the web pages when the server is accessed by a single user. Without optimization our homepage got a score of 77/100, with dozens of suggestions for changes. (Our site is laid out to be easy to edit and maintain rather than being optimized for maximum performance.) With mod_pagespeed turned on, the score jumped to 95/100. Looking at the analysis, it appears that mod_pagespeed mainly changed the caching settings and combined images into CSS sprites. In the above chart the network requests run concurrently with page rendering, so the perceived improvement in both network transfer time and page render time is around 20%, which isn’t bad for simply installing an Apache module. The question is, how long does this performance improvement last when the server is subjected to load? This question is somewhat difficult to answer since under load the render time isn’t available, so we use “load times”, which is the time it takes for all of the content to be loaded across the network. This is valid for load comparisons because load times represent the vast majority of the perceived time it takes for the user to view the page. On top of that, its impossible to actually measure render time because of the subjectivity involved. Does the user perceive that the page has rendered when 80% is rendered? 90% For many pages the user considers the page rendered when the part they’re reading is finished, and the parts that are uninteresting (below the fold for example) don’t matter. 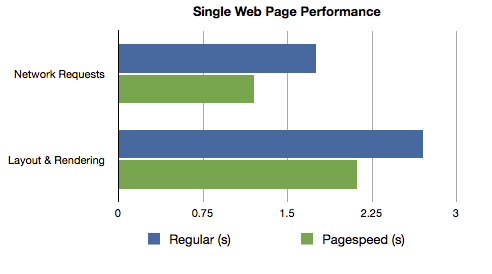 The following chart compare web page load times between this typical optimized Apache2 installation, and the same installation with mod_pagespeed installed. When mod_pagespeed was turned on, the web page load times quickly doubled, so that by somewhere around 300 to 400 concurrent users the advantages of running mod_pagespeed were outweighed by the overhead in running the module. The reason appears to be additional system load from mod_pagespeed, which is roughly double over a non-optimized system. The system was definitely not I/O bound, as I’ve benchmarked the EC2 to EC2 bandwidth of this virtual server to be around 600Mb/s, and these tests topped out at only 200Mb/s. The test was designed to zero in on the effects of mod_pagespeed, but in real life your site is likely to be dynamic, not static. As such, these results may or may not apply to you; the only way to tell is to do the experiment on your own site. However, if your site has many static pages, the obvious conclusion is that mod_pagespeed makes sense to install only if your site is lightly loaded, and you can verify that the modified pages are actually faster than the default pages. In my case there was about a 20% speedup, which was noticeable. You’ll want to check that all dynamic pages and scripts function however, since mod_pagespeed broke our shopping cart, and there could possibly have bad interactions with dynamic parts of your site as well. The obvious best practice here is, if absolute page load times are important, then it is worth it to take the time to make the recommended Google Pagespeed changes by hand; that way you retain the full power of the server. Note that I tried to use the worker MPM but could not get it to run with mod_pagespeed without crashes. You’ll want to be sure to apply these ulimit changes as well. response-headers for X-Mod-Pagespeed to find out for sure. 2. Do you know whether your server was I/O bound or CPU bound? It would be a great case study to see how these impacted your tests. Thanks for taking the time to read my article! I updated the article to answer your questions 1-3, as other people may have been wondering the same things. I’ll try out your recommendations, but caching isn’t as simple as you’d think. Ostensibly disk-based caching would be slower than memory caching, especially on a virtual system. What we’ve found, though, is that Linux will cache the files in memory, and the resulting performance is faster than Apache’s actual memory-based cache. Anything can happen, though, so I’ll give your suggestions a try and see what happens! I’ll take a look at your web pages to see what the working set looks like. BTW mod_pagespeed definitely does add overhead: it parses the HTML on every request (figure ~10ms per HTML request), though it caches the resource optimizations. So it doesn’t matter much whether the page is statically generated or dynamic. The bulk of the CPU time at startup is typically in image compression, but once an image is cached, that should no longer be a factor. The other question about caching is how large your mod_pagespeed file-cache is, and whether during your load-test we are evicting anything. Your pages don’t look that large, though so I’m guessing you are running purely out of disk-cache in which case you might just be seeing the HTML parsing overhead. We can definitely work on improving the speed of that but it hasn’t boiled to the top of the priority list. One last question about your jmeter load-test set up. Are you fetching resources on the page? Or just the HTML files? The real load include both, and mod_pagespeed should serve already-optimized resources from its cached reasonably quickly. Part of the principle also is that with 1-year cache lifetime your server will spend less time serving resources than what you’d typically want to set if you were manually setting TTLs to allow site changes to propagate in a reasonable amount of time. That won’t come out in a load-test, however, because your existing TTL is probably longer than a load-test. Moreover, if you are not using some automated mechanism to sign URLs based on content or source-control version, then you have to trade off your ability change it vs browser cacheability, whereas with mod_pagespeed & other WPO tools you get the best of both worlds. So can lazyload_images, convert_jpeg_to_progressive, and convert_jpeg_to_webp. mod_pagespeed is conservative about putting those aggressive options into the core-filters, but most sites will look identical using those filters, and perform much better. This doesn’t directly address your point that it can affect server load, but it perhaps offers additional value on the other side of the equation. We use our own load testing software that is greatly superior to JMeter 🙂 Yes, it simulates download of the entire page. I re-ran the tests using the suggested shared-memory lock and compression quality set to 85, and saw a measurable improvement over the base measurement… A detailed report will follow shortly.